Are "bawl" and "ball" pronounced the same for everybody? Or differently? I'm not aware of any variety of English in which they are distinct. We know, of course, that many Americans do not distinguish the LOT and THOUGHT sets (although many other Americans do): but that’s not the issue. If there are people who consistently distinguish bawl from ball (and Karen insists that she is one such), then we have to recognize a split within the THOUGHT set, with an otherwise unreported choice of vowel in ball. It turns out that for Karen ball rhymes with doll and Moll, as well as with tall, wall, fall, call, hall etc. ; but not with words spelled with aul or awl, e.g. haul, maul, scrawl, trawl. I was interested to hear this, but I continue to find it odd that there is no mention of this possibility in Kenyon’s American Pronunciation or as far as I can tell in any other descriptions of AmE phonetics. How come that no one seems to have mentioned it before? For me, the "a" in ball is the allophone of /ɑ/ which occurs before /l/ and is slightly rounded; the "au" and "aw" are the /ɔ/ phoneme, which has more inherent rounding. I expect I'm one of a minority, but it looks like others from my part of the US (Minnesota) and in my age group do have the distinction. She also kindly supplied a sound file in support of her description. Even if only a small number of people have this distinction, it certainly should be studied and mentioned in the literature. 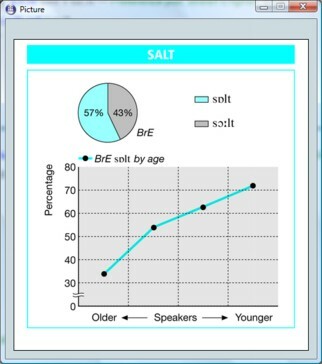 We do have a comparable phenomenon in BrE, in the shape of the choice between ɔː and ɒ in words spelt als or alt — words such as false, salt, fault, halt, also. Since I knew about this at the time I wrote Accents of English, I created a special subsection (b) for THOUGHT, to cater for it (p. 146). If I’d known about Karen’s type of AmE, I’d have catered for that too: but I’d never then come across any mention of it. I shall be away now until the end of the month. Next blog: 4 Feb. This kind of incomplete LOT-THOUGHT merger before /l/ is consistent with my experience, but because it's sub-phonemic, I never paid attention to it before, thus ignoring Loman's Dictum ("Attention must be paid!") Thanks for publicizing it. Though you may be on the right track, still, I question calling it an incomplete LOT-THOUGHT merger, since, for those of us Americans without the cot-caught merger, those two words have distinctly different vowels. As far as I know, in North American English LOT and THOUGHT are either (completely) merged (regardless of context), or not merged at all. There's an ongoing "incomplete LOT-THOUGHT merger" for many people in England, though. Incidentally, this kind of "incomplete merger" is a rather well-known phenomenon in the histories of many languages. In historical linguistics it's called primary split (an admittedly vague term). In Modern English, /a/ split from TRAP and merged with LOT when preceded by /w/ (normal perseverative assimilation), unless followed by a velar (cf. wax). As far as I know, there are intermediate stages like only having Don and Dawn merged, while still maintaining a distinction between cot and caught. Interesting. Saying them aloud upon reading the beginning of this post, I noticed a slight difference between the two. It's slight enough that I wouldn't expect it to reliably occur in speech, nor that others would necessarily notice. And indeed, the more I say them, the more they come to sound the same. And after reading the last quote from Karen, I think maybe it comes from the fact that "bawling" is much more common than "bawl", and thus, with the two syllable word, the vowel is less affected by the l, and this carries over, sometimes, to the word "bawl" without the "-ing" ending. I'm an American from the middle of the country. Dear Professor Wells, this is something I have been wanting to ask you about ever since discovering your blog, but never quite plucked up the courage to do so! In my speech (which is generally RP) word-pairs such as ball/bawl, hall/haul etc. are definitely distinct (though not, I think, in the same way as Karen Chung). The latter of each pair has [ɔːɫ] whereas the former has … something else. For want of anything better I tend to render it as [ɫ̩], but that is not really correct: there is a vowel-sound whose distinctive features I am not competent to describe. It feels extremely "back", certainly more back than the [ɔ] that it contrasts with. I have sometimes wondered if the state of the tongue root may be involved. This has baffled me ever since I first took an interest in phonetics at school, and I would be delighted to find an answer after all these years! Perhaps you vocalize the /l/ in the first word of each pair, but don't do so for some reason in aw/au words. An interesting suggestion, thank you, but it does not seem to account for what I am observing. (As far as I can make out, the speech of some of my peers exhibits the same distinction, i.e. it is not just a personal idiosyncrasy.) It may be that the /l/ (and its associated vowel) is pharyngealized in the first instance, but velarized in the second. (Certainly there appears to be a significant constriction at the back of the mouth in the one case but not in the other.) Though if I understand correctly, pharyngealization and velarization are not generally recognised as existing contrastively. I think we need to hear you say all/bawl, hall/haul etc. Maybe, you can put a soundfile online somewhere. Any vowel + [ɫ̩] would mean two syllables. Do you feel you have two syllables in ball, hall? There's only a very subtle difference between a velarised and a phryngealised L.
Could it be that your L's have more lip rounding (if they aren't vocalised, as you say) in some of those words, but not in others? I, too, would be very interested in hearing a clear recording, if you could upload one somewhere. Thank you for your comments. I am actually a bit surprised to find that this is not a mainstream distinction – I had rather expected that as soon as I mentioned it, people with more experience than me would immediately recognise what I was talking about, and I would have my long-sought answer! I shall see if I can find out how to upload a recording. In the mean time, in answer to the question, there is just one syllable: I write [ɫ̩] partly because I have no idea how to write the vowel, and partly because the division between the vowel and the /l/ is seldom clear. I think there is probably an increase in lip-rounding, but the main articulatory distinction that I can perceive is the constriction at the back of the mouth, such that any greater constriction would tend to produce a fricative. In the recording which accompanies my book on English phonetics published in 2005, a woman from Lawrence, Kansas has the THOUGHT-LOT merger (with [ɑ]), but pronounces the words calm palm psalm with a rounded vowel [ɒ]. This can mean that she has a tiny group of words (calm palm psalm) with /ɒ/, while she has /ɑ/ in other words in the PALM set, as well as in the LOT and THOUGHT sets. In the accompanying recording of the English phonetics book written by late Prof. Takebayashi in 1991, a woman from Ohio, who has distinct LOT and THOUGHT vowels, pronounces (again) calm palm psalm with the THOUGHT vowel. To my knowledge, these are also patterns which are not mentioned in the literature. It seems to me that calm palm psalm can make an independent group out of (64a) in your Accents of English.